On her ten-track third studio album “Cider,” singer-songwriter Gwyneth Moreland starts with a nifty 50’s-60’s style track that is a delight: “Movin’ On.” The song has some melodic acoustic guitar and David Hayes’ harmonica to keep the tune upbeat and potent. She has a voice that is country-folk flexible like Emmylou Harris, Gillian Welch, and Shawn Colvin. Nothing quirky or outrageous. Just sweet, and attractive. Little Bird,” finds Ms. Moreland’s voice rich with Americana and her lyric pronunciation is exhilarating. This from a native Northern Californian. Moreland has the nuances and countrified confidence of singers that were planted in Appalachian soil and she uses this all to her advantage. She has successfully absorbed the traditions without a doubt. There’s a documentary about the music that came out of the Coen Brothers’ film “Oh Brother, Where Art Thou?” with" George Clooney. That film introduced many moviegoers to bluegrass, country, and folk traditions of another musical world. The accompanying documentary was called “Down from the Mountain,” and it was filled with legendary artists of that genre who performed the songs that were included in the film. There’s a moment where Emmylou Harris, Gillian Welch, and Alison Krauss sing “Didn’t Leave Nobody but the Baby,” – and this song reminds me of Gwyneth. I feel she would have been an ideal addition to this trio of great women vocalists for this kind of song. This is how comfortable and expressive Ms. Moreland’s voice is. Is it old-fashioned? No, not necessarily. It is traditional in spirit. It has a soul, it has a fascinating pedigree. Voices like this from the past and with today’s technology show how Ms. Moreland’s reflective power renders the songs quite modern with the necessary beauty and a wet with rain dirt scent. “Eloise,” is radiant. The musicians support Ms. Moreland but manage to maintain that back porch deep South sound of personal and poignant. This is a woman with finely tuned musical gifts. Honed by years of listening to everyone from Bob Dylan, the Carter Family, and Nanci Griffith. These are ideal influences for a young lady like Gwyneth and while I am assuming she has listened to these people -- she certainly does have their spirit running through her fine presentation. Moreland doesn’t hesitate to admit that she loves the old-timey three-part harmonies. With the right voices, it is a great sound. Gwyneth plays often with multi-instrumentalist David Hayes (bassist on many Van Morrison LP's), and Morgan Daniel (Ms. Moreland’s brother) on guitar in addition to Gene Parsons (former Byrds-Flying Burrito Brothers) on pedal steel, banjo, and harmony vocals. A little trivia for older readers: Ms. Moreland’s aunt was the late Oscar-winning actress Donna Reed who played opposite Burt Lancaster, Frank Sinatra and Montgomery Clift in the classic film “From Here to Eternity.” Later Ms. Reed had her own comedy TV show that ran for many years. In her later career, she was also cast in the classic TV drama “Dallas.” Quite good genes I would say (I was in love with Donna Reed when I was a kid). The title track “Cider” is a slow enchanting song while the final track “Summer Song,” is one of the strongest songs on the collection. It’s not a rocker or pensive folk tale – just a wonderfully melodic well-arranged song that suits Gwyneth’s voice admirably. This is a fine showcase for Ms. Moreland. The melody winds around hauntingly and the support of the many musicians in her lineup never get in her way. I enjoy particularly how Gwyneth pronounces her lyrics. It allows her to have a signature sound besides just the tone of her voice. Her phrasing and intonation are excellent. As the song concludes she picks up the beat and the 38-minute album ends with an optimistic emphasis. I like the ruralness of the album and I believe that Ms. Moreland has achieved her goal: Creating homegrown music that others can relate to and appreciate. Gwyneth Moreland plays well with grown-ups. She of course is one, but she’s taken it on herself to bring on board her new record some of the headiest of musically fermented experts to play along with her. Her album features an image of orchard fruits in a fruit basket. The fruits are ripe from a combination of her intoxicating range and often unique voicings and the stripes-earned instrumental and verbal elicitations of players supporting her sonic apples and oranges. The tunes are her own fresh offerings, many co-written with husband Skyler Hinkle, all one form or another of that catch-all, Americana. To my ear and understanding, each tune grows in nuance and individuality. Number one on the album, “Movin’ On” is jazzy, A tune appropriate for a swing band at the local VFW that night. She has a personal way of delivery that is fresh like the analogy I paint of this musical marketplace. A straight-forward, personable, rich round volume varying in pitch as the work rests differently in the air fresh out of the apple basket wire and slats. I got to see/hear her perform in one of the many nicely idiosyncratic guest-room/suite concerts by artists from throughout the world at this year’s Folk Alliance International Conference in Kansas City. The album comes across as fresh as she did in performance and could have dropped off a 1950’s fruit wagon on the way to Saturday market..
One of her colleagues on the album is the iconic Gene Parsons, one of the original Byrds, yes, the Byrds! and later the Flying Burrito Brothers. He can clearly be heard on one tune with his pedal steel undulating throughout the song, and his banjo paints a really jaunty picture on a couple of other outings. You can’t see the bright, bushy, white mustache while he picks away on that rootsy instrument. He’s quite incredible on the album, as is Steven Bates, the striking young picker and crooner on guitar. I was just listening to the Byrds on vinyl this morning. David Haynes, who has played with almost everyone but mostly with Van Morrison over the years, comes in on bass mostly, his major piece, but also vocals, electric bass, mandolin, percussion, keyboard, guitar, and harmonica. He had been a teacher of Gwyneth and is a regular fixture in her music, live and on record. All these folks, and then some, including brother Morgan Daniel and his smiling face on electric guitar and harmony vocals, are in evidence. Most of them live in proximity of each other in the lovely Christmas greeting-card setting of coastal Mendocino, CA. Gwyneth, who is also a veterinary technician, and her husband and kids live in a country setting complete with sheep, horse, chickens, and other livestock. The setting is reflected in the rootsy quality of many of the songs on the album, the folksy evocation of the simple, yet rich and inwardly complex life in a place resembling wilderness in ways. Some of my favorites are along those lines of her immediately previous cd, Ceilings, Floors, and Open Doors. This includes songs such as Slaughterhouse Gulch and Pine Box Sailor, both of which climbed the folk charts. I love the funky, rustic melodies here and simple, yet rich feelings expressed. Take me down to Union Station/to my black coat put a pink carnation/Kiss me twice for love and luck/In my hands place your last few bucks/Honey babe I’m leaving you. Won’t you listen to the train coming down the tracks/It carries me away, won’t carry me back/I know I’m not the one you treasure/Gonna catch that train, the California Zepher/Honey babe I’m leaving you/All aboard the California Zepher. The coastal-crested crooner is capable of creating her own traditions. Her song “Little Bird” has all the qualities and style of a tune handed down – or about to passed along – through generations. When you hear that, you’d swear you grew up with it. It has that quality of folk song that feels lasting, in the sustaining, often comforting way good folk songs can be. Another of those I’m most attached to is “Broken Road.” Love the sound and sense of this. Snake of light above me keep my feet upon the path/Keep my footsteps steady strong and hide my heart from wrath/Save a sack of grain for the horse for when it snows/And send word to my baby that I walk a broken road. Gwyneth grew up around music played on vinyl offerings of Sonny Terry and Brownie McGhee and Joan Baez and such by her artist parents, her father a metal sculptor and her mother a fiber artist. Speaking of family, her aunt is the famed TV and movie star, Oscar winner Donna Reed. Gwyneth Moreland’s Cider is an intimately arranged and produced affair that positions Moreland as one of the pre-eminent talents working in folk music today. Folk music is an all-encompassing term, as used here, because there are a number of musical strains coloring the album’s ten songs and it resists easy labeling. Moreland’s talents are further burnished by working with a number of excellent production and accompanying musicians who fully understand how to elevate these performances. There’s obviously a tremendous amount of care taken with these songs – the nuanced recording, tasteful playing, and excellent construction defining these tracks helps make the release stand out as one of the genre’s marquee albums in recent memory. Creating a musical gem doesn’t require the same amount of pressure needed to form diamonds – instead, there’s a mix of focus and relaxed grace needed to make your effort stand out. That’s present on this album and there’s a palpable confidence that makes it even more memorable. Even at its darkest moments, there’s a real sense of joy in Moreland’s music making. It comes through on material as seemingly disparate as the opener “Movin’ On” and the third and fifth tracks, “Little Bird” and “Eloise” respectively. The former has a lighter touch, but it nevertheless has a classily handled theatricality and Moreland’s crystalline phrasing aches with real feeling. “Eloise” has a much moodier demeanor and minor key thrust, but there’s never a moment during any of these songs when you truly think Moreland has succumbed to despair. Another memorable aspect of the songs in this collection is the focus she keeps up throughout the song. Both songs also show her ability for hitting upon recognizable traditional language in new and inventive ways. Call it a talent for pouring old wine into new bottles. “The California Zephyr” has Gene Parsons contributing outstanding banjo playing that never outshines the accompanying instruments but, rather, plays with them. Moreland really excels at conjuring a haunting feel, placing these narratives on the biggest of possible stages, but there’s never a sense of the songs being overwrought. They are carefully crafted mini-dramas each time out. There’s certainly a strong sense of the bittersweet altering the taste of “Your Smile”, but it may be the real sleeper on this album. It has a very deliberate, pensive arrangement centered on acoustic guitar, naturally, but the backing vocals joining Moreland at various points throughout the song give it an even stronger poetic quality and the lyrics are particularly wrenching. Character pieces, to a certain extent, are the peaks on Cider and few are as detailed and fraught with tension like “Danny Parker”. The evocative language is given a further twist by her singing and it rates among her best vocal turns. There’s a very reflective feel defining the music and lyrics of the title track while Moreland underscores the atmosphere with an attentive singing performance. There’s a slight upward swing making the final track, “Summer Song”, sparkle in a way few of the other tracks do. It’s an appropriately hopeful finale that stays consistent with much of what’s come before. It varies the emotional mood of Cider just enough more to make it a deeper, richer experience. This is an unique release and seems perfectly realized in a way few albums are. Its cool and earnest confidence comes through from the first note to the last. The ten song album Cider from California based vocalist and songwriter Gwyneth Moreland heralds the full on arrival of a major new talent. She’s enlisted an impressive team to help her realize its potential. David Hayes, noted for his work with Van Morrison, handled the production, engineering, and mixing chores while Karl Derfler’s mastering talents, which have distinguished previous Tom Waits releases, work their magic on this collection as well. The album’s musical talent is equally top notch. Legendary pedal steel player Gene Parsons appears on Cider, contributing banjo as well, while some possibly unlikely collaborators like former Frank Zappa drummer Ralph Humprey appear as well. The album doesn’t have that classical California feel – instead, this is a wide-ranging collection with a personal sound transcending both time and geography. Cider is a memorable musical experience combining great artistry with a boundless heart – it is sure to entertain many. It’s obvious she’s an artist who takes great care with her performances. “Movin’ On” starts things off with a wispy shuffle that never gets ahead of its self. It’s guided by acoustic guitar and another hallmark of the album comes through in this song – the refusal of either Moreland or her band mates to become unnecessarily self indulgent. The same feel comes across on the song “Broken Road” and it does an excellent job of balancing mood and musicality. Ralph Humprey makes his mark on the song with great drummer that gives it the right amount of sway but never pushes the tempo too hard. The acoustic guitars on “Little Bird” have a much more assertive push with their straight ahead chording high in the mix. There’s some of the same solid narrative excellence defining this song that sets the best material on Cider apart and Moreland renders it with outstanding style. There’s a pleasing amiable jaunt defining the song “Farmhouse” and it defines the song with an understated rural feel without ever being too pretentious. The beauty of the vocal shows the same consistency that’s reached across the entirety of Cider and brings an unearthly glow to much of the material. One of the album’s darkest numbers, “Eloise”, boasts a delicately woven grace that plays more layered than many of the other songs. The shadowy strains of the song are never played with too much theatricality and, instead, gain a lot of atmospherics from her sensitive treatment of the song’s depth. The purest love song on Cider, “Your Smile”, isn’t free of its own pains and derives a great deal of its power from the mix of devotion and heartache. It is one of her most successful attempts at incorporating backing vocals and they further accent the regret bubbling through the performance. It’s also one of her greater lyrics on an album full of them. It makes a dramatic tandem with the song “Danny Parker”. This is easily one of Moreland’s finest moments on the album and has a beautiful elegiac feel few of the other superb songs possess. The album’s final songs, “Cider” and “Summer Song”, bring the release to an ending akin to a leaf falling to ground on a early fall day. Moreland brings the right amount of force to this conclusion and makes for an excellent conclusion to one of the year’s best albums. Gwyneth Moreland is shuffling and singing her way out of town with “Movin’ On”. The tune rambles as her memories fall back into summer on a track from her recent release, Cider. In my early listenings I heard a real homey sound, as if it had been written and recorded in her living room. Only afterward did I learn that most of the songs are co-written with her husband, and her brother and niece play on the album that was produced by their son's godfather. It's a family affair, and it shows. The album opens with a slow, swinging blues of "Moving On." Not to be confused with Hank Snow's "I'm Moving On," Moreland's way of moving on is about walking in the country, listening to the birds sing while the wind caresses the trees, wondering where the time has gone. In the next track, "Broken Road," she mixes some Robert Frost-like imagery: "Snake the light above me/guide me home to sleep/feet are lost in darkness/and promises to keep." She sings it like an earnest Neko Case, but without the reverb or any trace of irony. The songs on the album are clear and distinct. There is no doubt they reflect her life and experiences lived in the California countryside. As Moreland told me in a note, "Many of the songs on Cider reflect our life here on the family homestead in Mendocino, where we harvest apples every fall. And it was our homemade hard cider that continued to inspire us as we wrote the songs for the album." While she tours mostly in California, she did trek to the International Folk Alliance in Kansas this past winter. Fortunately, you don't have to go that far, just down to your favorite record store. The personal nature of Gwyneth Moreland’s songwriting is a hallmark of the best folk music, but her musicality is equally powerful. There’s melody galore filling the album’s ten songs and rousing vocal performances that never takes the path of least resistance and, instead, obviously invests enormous emotional capital in getting over the lyrical content. There are country and blues music influences making their presence felt throughout the release, but the guiding spirit behind these recordings is Moreland’s phrasing and the highly literate quality of her material. Much of the credit for the album’s presentation must fall on Moreland’s producer David Hayes, a veteran of working with no less of a legend than Irish singer/songwriter Van Morrison. In the end, however, Gwyneth Moreland rises to the occasion time after time again with a wide ranging interpretation of her own material that never risks imitation despite her countless influences. One of the strongest added influences on Cider is, certainly, classic country music. “Movin’ On”, on the basis of title alone, certainly invokes those motifs, but Moreland never goes in for a craven regurgitation of that style lacking any personal punch. The shuffle beat never manifests a lot of energy but it’s an excellent way to introduce listeners to the album’s musical world. She definitely restrains herself even more with the second song “Broken Road”. Moreland has an interesting skill for writing material full of obvious love and deep feeling, yet bring emotions to bear connected with loss and heartache. There’s a craftsmanship emerging from the album early on that will completely bring listeners into her world. She invokes traditional folk music at a number of points throughout Cider and one of the zeniths of that inclination comes with the song “Little Bird”. The language of her songwriting, however, is never remote from our modern experience and it makes it clear she views the traditional music template pursued her as a vibrant vehicle for her own emotional explorations. “Farmhouse” is one of Cider’s more musically direct cuts with straight-forward strummed guitar and big, blocky chords that strongly announce themselves yet never lack their own melodic value. It’s certainly one of the album’s lighter musical number, in the sense that there’s no real feeling of downcast to be heard throughout its duration, but nonetheless fits in quite nicely with the remainder of the release. “The California Zephyr” is a traditional folk song ripped from an uniquely geographic experience, yet it magically invokes both country and folk traditions without any stylistic confusion. “Danny Parker” is Moreland’s finest writing on Cider – hands down. This is a lyric rife with detail and the music is equally up to the task of dramatically depicting the emotion it invokes. The album’s closing cut, “Summer Song”, ends Cider surrounded by a brighter hue than many of the other songs aim for and this slightly surprising final turn is perfectly in keeping with the sense of daring that makes much of the album work so well. Gwyneth Moreland’s talents are considerable, but perhaps her greatest talent is for understanding exactly how to present her own vision in a way that promises to draw in the most listeners. The fact that an album like this can exist in 2017 is testament to the abiding values of the popular music art form. Gwyneth Moreland’s Cider features ten tracks with a decidedly folk influence, along with other styles coloring the writing and performances, but it touches on the eternal verities of human experience in a timeless and highly personal way. The sunlight and shade of Moreland’s California upbringing vary throughout the songs and reflect the personal touch that makes this album stand out more than many other releases in recent memory. Moreland has the skill level of someone who has been doing this for many years and has a well honed musical vision. It’s truly bracing to imagine how much further she may go from this point on. Cider is an unusually powerful release from a musical scene that’s far from moribund. It would be easy for us to assume that spartan music like this doesn’t challenge listeners. The style seems so archaic in our technologically advanced time, but few musical presentations still communicate as effectively as a first class singer working in an acoustic setting that emphasizes taste – never overplaying and just serving the melodic purposes of the composition. “Movin’ On” is the first example of this on Cider. She takes on one of the most familiar tempos in country and folk music, even rock, the shuffle and makes it work for her with a surprising freshness. “Broken Road” shows a bluesy tinge, but it likely owes much more to the classic country tradition despite the continued low-fi approach. The mood is decidedly less jovial and carefree, but the same attention to detail makes both songs stand out. There’s a steadiness to the guitar playing on “Farmhouse” that has a slightly jovial air as well. There’s much of a reliance on worked out melody lines, but the chunky guitar chords set their own sort of atmosphere. “Eloise” reverts to a much more melodic approach but there’s a consistency of structure defining the entire collection that gives even these more delicately wrought tunes a definite shape. “The California Zephyr” has some classic bluegrass feel making its mark on certain passages thanks to the inclusion of banjo, but it is never a dominant musical factor of the song. Moreland’s ability throughout the album to incorporate a variety of sounds without steering the songwriting in specific directions sets her apart from many contemporaries. “Your Smile” is another sterling example, likewise, of her ability to write emotionally engaging material that strikes both a personal and universal note. It has a clearer structure than many songs on Cider, but that stronger skeleton never hampers its ability to connect. “Danny Parker” rates as one of the album’s strongest pieces and makes for a great pairing with the title song. “Cider” is the album’s penultimate cut but could have easily served as the finale. There’s a salutatory air to this number that helps make it one of the most beautiful moments on an album that’s sure to enchant many. Gwyneth Moreland is a must hear for any fans of quality songwriting and musicianship. There’s a rich lineage of Americana music informing Gwyneth Moreland’s release Cider. The influence of artists like Sonny Terry & Brownie McGhee, Joan Baez, Gillian Welch, and Bob Dylan run through the album’s entirety while she’s accompanied by stellar players like pedal steel guitarist Gene Parsons whose list of credits includes The Byrds and The Flying Burrito Brothers – among others. The ten song collection never sounds imitative, however, and instead illustrates how successfully she filters those aforementioned influences through her experiences and personal artistry. The release is devoted to Moreland’s originals and she proves to have an individualistic and idiosyncratic voice reaching far past the ken of typical folk acts. This music is, in her hands, not some beautifully ornate butterfly to be pinned beneath glass – instead, she brings traditional elements firmly into a modern context and it makes for one of 2017’s greatest listening experiences. “Movin’ On” is powered by a slow, lazy shuffle and gentle acoustic instrumentation. The percussion has a lightly brushing effect and punctuating the arrangement with occasional flashes of harmonica adds just the right amount of extra color. Moreland’s voice is accompanied by some occasional backing vocals, but she largely glides solo through equally relaxed and easy going verses – the clarity of her voice is a minor marvel and she works magic with a beautifully wrought vocal melody. The album’s second song, “Broken Road”, features some of Ralph Humprey’s tasteful swing on drums. While the song is never specifically downbeat, there’s certainly a light melancholy edge shaping the song in significant ways. She never fails, however, to treat it with singular grace and emotion. Some of that same melancholy makes its way into the track “Eloise”. The recurrent and artfully ominous bass pulse resounding throughout the song gives it much of that sound, but Moreland’s vocals and the understated instrumentation contribute a lot to it as well. She certainly references longstanding folk traditions in her songwriting, but it never sounds dated thanks to her ability for pushing a distinct point of view. Gene Parsons guests on banjo during the song “The California Zephyr” and his skills on the instrument make for a great addition to an already fine track. This also ranks as one of Moreland’s best vocals on the album and she throws herself into the fine lyric with uncommon zest. “Danny Parker”, the album’s third single, has an older feel than the other material in some way and the focus she brings to the lyrical content makes this, truly, one of the best moments on Cider. The album’s title song is highlighted by Parsons’ pedal steel contributions, but Moreland matches them with one of her more nuanced, yet command, turns as a singer. The song builds with the same extraordinary patience defining the earlier tracks and stands as another of the album’s peak moments. Gwyneth Moreland has written and recorded a collection with lasting value. This collection has colossal emotional and musical value and Moreland comes out of this as an artist with boundless promise for years to come. Great Americana music has a down-home feel, and Cider, the new album from Northern California folk songstress Gwyneth Moreland, embodies that sentiment; everything about Cider is homegrown—its songs were written locally, recorded locally, and will be distributed by local label Blue Rose Music. “I’m really excited about the opportunity to be a part of getting the northern California sound out to the world,” Moreland remarks of the album, set for release on April 21st. The youngest of five children from a musical household, Moreland was raised on a steady diet of Dylan, Baez, and traditional hymns, with a healthy respect for roots music. At 16, her oldest brother gave her a copy of Gillian Welch’s Revival, and she was transfixed. “It really spoke to me. I instantly started learning her songs and started performing them with my brother,” she recalls, though she still has yet to meet her idol. “I saw that some friends of mine on Facebook had Thanksgiving dinner with her last year, and I was like ‘I’m getting closer!’” she laughs. Mendocino-raised folk songwriter and singer Gwyneth Moreland performed on Sunday to a packed house in the Little River Inn’s Abalone Room. Moreland returned to her hometown of Mendocino in 2005 after attending college and working as a veterinary technician in Denver. Her musical career has since continued to blossom. Moreland’s latest album, “Cider,” is said to underscore her gift of writing acoustic arrangements. “Cider” is set to release on April 21. It will be Mooreland’s third solo album, the first of which will be released on the Blue Rose Music label out of Sebastopol. Moreland wrote or co-wrote all 10 songs alongside her husband, Skyler Hinkle, with help from Angie Heimann and Michael Monko. It takes a lot to laugh, it takes a train to cry, Bob Dylan once said. But for California folkie Gwyneth Moreland, it takes a train to send that final, defiant kiss-off to a withering love. Moreland’s song “The California Zephyr,” which appears on her forthcoming album Cider, was inspired by a voyage she took on the train of that same name in 2008, when she was on the eve of a break-up. “It was a real 3000-mile trip, and it was amazing,” Moreland says. “Days and days on a train, stopping off to visit friends — just me and my Discman (yeah, that’s right). What was I listening to in those days? The Carter Family, Hank Williams, Guy Clark, Buck Owens, and Loretta Lynn. I was also discovering new female artists such as Feist, Regina Spektor, and Nellie McKay. I also knew a breakup was bound to happen with my then-boyfriend when I got back home to Mendocino, California. Below, watch the video for “The California Zephyr, which was filmed by Bay Area photographer Jay Blakesberg. Cider drops April 21 via Blue Rose Music. When it came time to begin working on her new album, Gwyneth Moreland turned to her own backyard for inspiration. It was the rugged and beautiful landscape of her Northern California hometown of Mendocino, a place that has long embraced artists. She also turned to the music she grew up listening to – artists like Joan Baez, Bob Dylan, Sonny Terry and Brownie McGhee, Billie Holiday, and contemporary folkies like Gillian Welch. The result is her new LP Cider, which comes out March 10th on Blue Rose Music. With her expressive vocals and reflective lyrics, Moreland balances traditional folk and Americana, and even incorporates jazz influences on occasion. The songs on Cider feel intimate and personal yet they resonate on a more universal emotional level. Today Glide Magazine is presenting a premiere of one of the standout songs on Cider, “Broken Road”. Inspired by Moreland’s native landscape, the song feels like a leisurely walk through the California sunshine, conveying a sense of peace with rich harmonies and acoustic guitar playing. “At first glance, one might guess that the term ‘Broken Road’ would be an artsy way to describe the symbolic bumpy path of life. But this song, written primarily by my husband Skyler, is about an actual road, a pothole-riddled mud slick that wound through backwoods junkyards and spilled into the dense undergrowth of Jackson State Forest. This was the path of the day, winding its way to a rural bus stop every morning in the dark or leading him home from his first job shoveling slop and manure at a farm owned by a miniature cattle breeder. When Skyler first wrote this song with a more rock ‘n’ roll style melody, he called it ‘Snake of Light.’ The imagery was so clear to me. It did indeed tell his story, but the muddy, rutted-out roads that carve through the misty trees here in Mendocino County were my childhood stomping grounds as well. At an early age, I too learned how to navigate through the brambly forest. My sister and I set out on many adventures to find the best river spots and hidden waterfalls that lay beyond the yellow forestry gates. In Their Words: "In 2008, I booked a 3,000-mile trip by bus and train from my hometown of Mendocino, California, through the Southwest. With a heavy heart, I began a journey of long rides on the Pacific Surfliner and Southwest Chief, with a return ride from Denver on the famous train, the California Zephyr. During this time, I began to realize that my relationship with my then-boyfriend/bandmate was dissolving. So, yeah: I was heartbroken, torn up, and in desperate need of an adventure. "As its title suggests, Gwyneth Moreland's new album Cider is sweet, tangy and potent. One of the most beautiful voices and talented songwriters I've encountered as a programmer, Gwyneth has packed this album with power, truth and joy. I can't wait to share this with my audience - Gwyneth's music just takes my breath away!" Beautifully stark and chilly, captured into 2 mics, paired to the bones it’s the better for it, wonderful rootsy tunes, complimented by the background noise of breezes, birds – you feel like you’re peering into the mechanics of the creation process. "The result is a singer/songwriter LP with the warmth and intimacy of a small house show." "Boldly eschewing the unnecessary and the superfluous to strip things back to the essence of genuinely intimate songwriting means she has created a record of stunning simplicity and feeling, which is undeniably moving and affecting." “'Pine Box Sailor', a beautifully simple folk tune that’s calm and relaxing. Her music tells a familiar story but does so in a subtle and entertaining fashion." Her music is bare but emotionally present, as if her songs were captured spontaneously as she played on her front porch in the last few hours of a spring evening. Running through strands of Americana and early folk music, she finds a beauty and emotional restlessness in unadorned words and sounds. 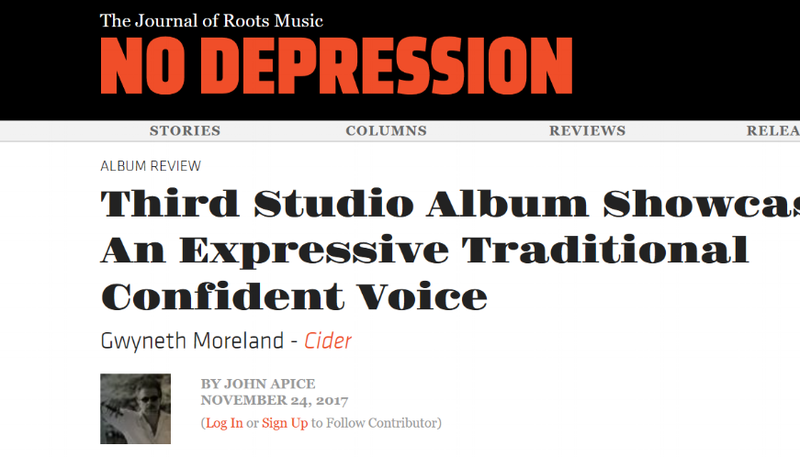 "Moreland’s voice on this album is so authentic to the genre that we initially thought we were listening to something remastered from the 70s and not a new release." "We knew there was something special when we saw Gwyneth Moreland in concert with David Hayes last December... sold out show, huge applause, standing ovations and even an occasional scream. Now, just a year later, Gwyneth & David have somehow managed to bottle that magic with Ceilings, Floors, And Open Doors... intimate, musical and as open to the world as the studio they recorded in." "Recorded under the sparest of conditions -- apparently just two microphones and an open door -- Gwyneth Moreland's "Little Black Flies" finds the Northern Californian in a timeless, contemplative folk mood that lingers long after the small but lovely song is through." "We are really looking forward to hearing the rest of this album." "From out of the Northern California redwoods on the beautiful Mendocino Coast comes a talent so unique, it makes me want to shout it from the hilltops to the world-wide airwaves." "What strikes me about Gwyneth’s music is the breadth of styles, and the refreshing straightforwardness of her writing. She speaks her mind in her poetry, and is not afraid to set up a musical expectation that shifts gears in unexpected ways. She evokes the lurch of the tavern and the comfort of home with a playful and poignant lyricism wrapped in clear musical arrangements."